After dropping a new event and Patch 1.11 earlier this week, San Diego Studio (SDS) released another huge content update for MLB The Show 18 today. 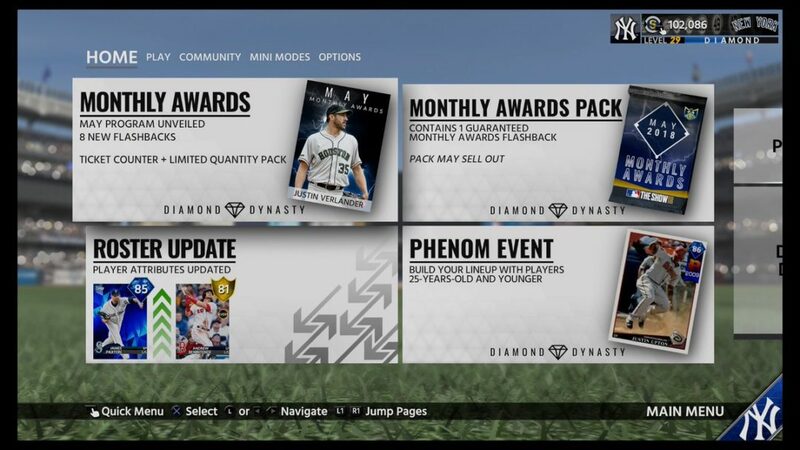 This update includes roster attribute changes, new Player of the Month (POTM) cards for May, and new player programs. The featured player of the month is Justin Verlander. Below are his attributes. To earn Verlander, you must collect all other players of the month (via the methods listed above) and complete missions with each. As it stands right now, May POTM Verlander is one of the best starting pitchers in Diamond Dynasty. Below is a look at future stars Gleyber Torres. Gleyber Torres, one of over a dozen new cards that dropped in MLB The Show 18’s Diamond Dynasty today.